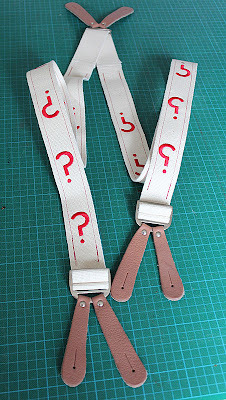 Now that I have sorted out how I will do the inside pockets, my attention turns to the collar and lapels. The charity-bought jacket I dissected helped me get a much better shape and fit to the fronts. My plan now is to crib the shape and cut of the lapels, though the collar does not have the correct shape, so I will need to adjust for that (see above, noting the angle of the collar coming away from the notch). 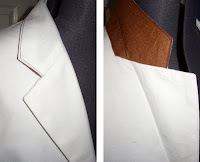 The lapels and collar I am using as a template are, like the fronts of the jacket I did earlier, from a more tailored school and a little different to the method I am used to. I think it is high time learnt some new techniques, so I aim to follow what I find. The main difference is the underside of the collar, which is made from a thick felt rather than the same fabric as the body of the jacket. I am working on the basis that this is applied last, so I look first at the structure of the upper collar. This is made in two parts, which at joined at a seam just below where the collar will roll. To create the shape of the collar, the two parts are curved in diverging directions (see right). You could be forgiven to think I have put the lower part upside down, but this IS the way they go together. I replicated the collar, adjusting the shaping needed as I go, and sew it to the lapel fronts as I would usually do. I then sewed them to the underside of the lapels, turned and pressed them. Then to see how things were progressing, I lightly pinned some of the red piping in place, so I could see the resulting cut (see left). 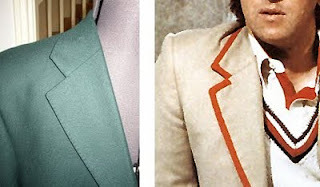 The cut and fall of the collar and lapels is quite critical, particularly since they have a piped edge, which if it is out by half-an-inch, it will show it and be very obvious. I quickly realize that though the jacket I have copied is a pretty good base to work from, the notch of the lapel and collar is set a lot higher than I need, which is a bit of a set-back. 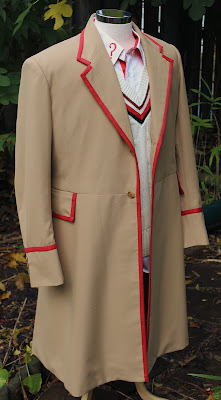 This is something I can’t put right by just re-setting it – I need to remove the collar, cut the top edge of the lapels down by around an inch, then cut a totally new pattern for the collar as it needs to reach further than before. 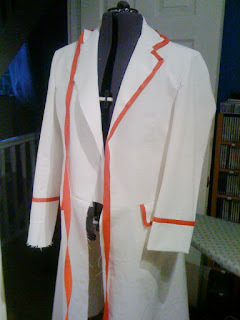 Once I have recut the pattern, I can again sew it to the lapel fronts, and then in turn to the fronts of the coat. The edge of the collar is folded to the final shape and pressed all round, and this time it looks a lot better (see right). I then cut and top-stitch in place the felt backing to the collar (see far right). For now I am just using a lightweight brown felt, but for the finished coat I will source a thicker and better colour. I am now much happier with this, so decide to start applying the piping for real. Because the coat is quite long, there is a lot of piping that needs to be applied, so anything I can do to speed up sewing it on will be worth doing. I know I will have to hand sew the ends surrounding the notch, but I think it worthwhile machine stitching the long run around the back of the collar to see how well it comes out. It’s hard work to start, as I need to wrap the piping equally around the collar so when I top-stitching through, I catch the edge on the underside as well. After a couple of false starts this works a lot better than I could hope, and I am soon hand-stitching the ends to finish the collar off (see above). This will save a lot of time and make the finished result a lot neater. Here is a picture of how far I have got (see below). It is starting to look like I am truly getting there, but I still need to finish the lining and internal pockets before piping the rest of the coat and hemming it to length.